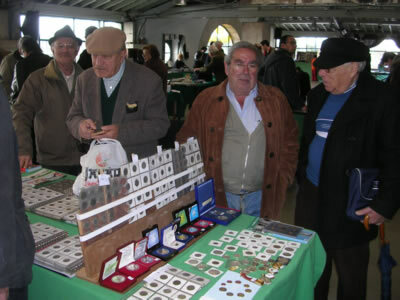 On every Sunday morning from 09:00 – 13:00, the second floor of the old market Mercado da Ribeira (map) (Market near the river since 1882), is reserved for coin and stamp collectors. 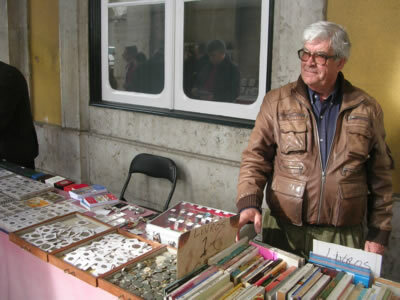 A good Dutch friend of mine is a coin collector, he asked me to browse the markets in Lisbon. I’m not really interested in coins, but this is worth a visit! 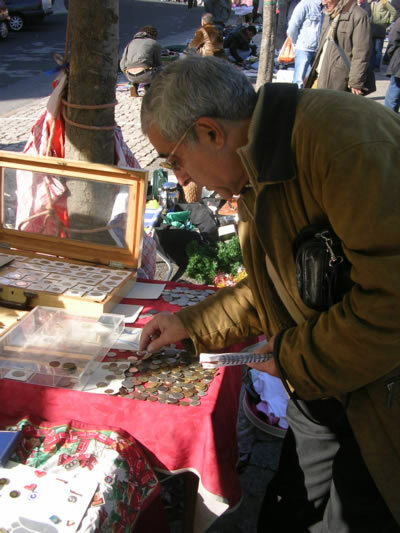 It seems that mostly men are interested in coin collection………and they are trading furiously! On the background you see covered market stalls: on the other days of the week market Mercado da Ribeira, Lisbons biggest open food market , is selling fom fresh fish to fruit, from ‘hot’ piri-piri to funeral flowers waiting for a dead body…. It’s really nice to walk around here, even if you are not looking for coins or old stamps. They sell more, like calendars, very old postcards and paper money. 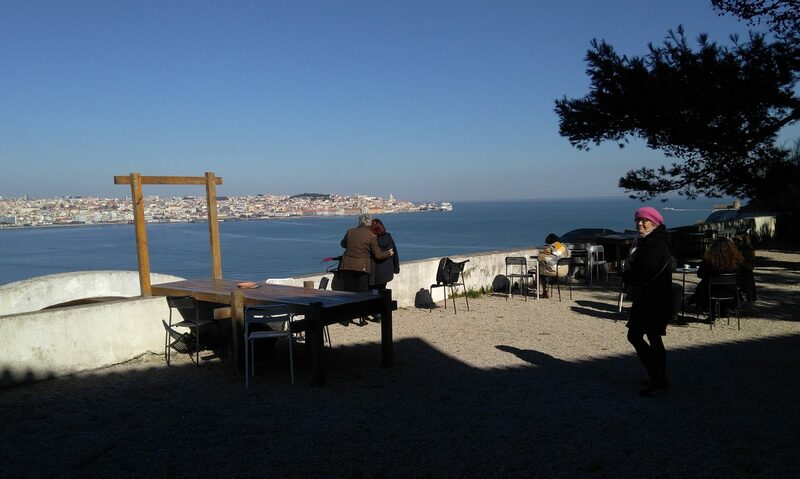 The 2nd floor of the market has also been converted into a touristy cultural center, selling locally produced items such as port, honey, and handicrafts. 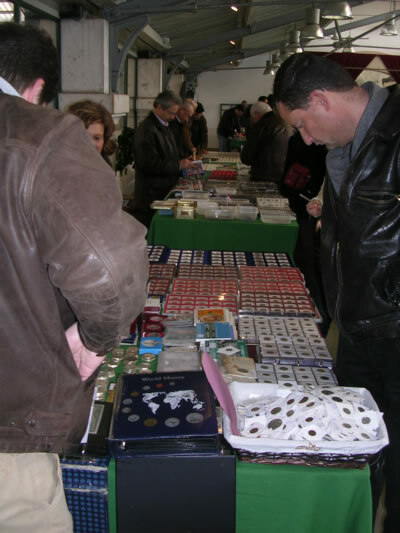 Also at Lisbon’s famous flea market Feira da Ladra, you can find all kind of coins…. 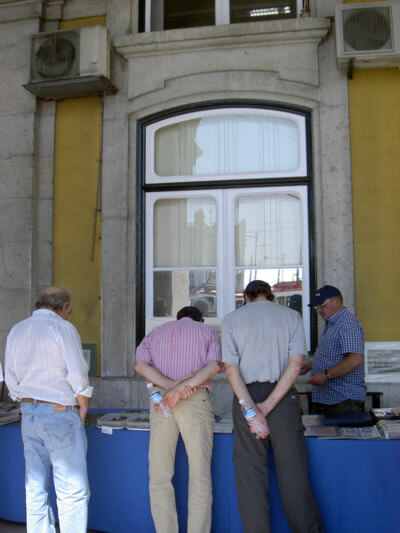 ….and on every Sunday there’s a small flea market at Praça do Comércio. This is João, don’t be afraid to negotiate the price! The collectables show has been moved to the first floor as the Mercado is being renovated. And the renovation – converting much of the Mercado to shops and restaurants – may spell the end of the show. But, that’s just the rumors on the bourse. If you speak English but not Portuguese, stop my Jose Manuel Silva’s table. 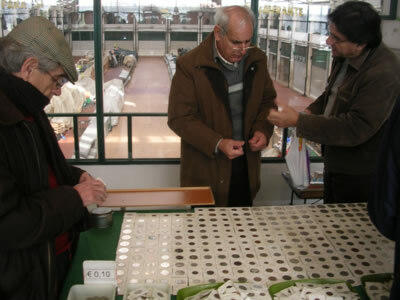 He speaks excellent English and he (and his friend Augusto) will be glad to tell you about the show and coin collecting in Portugal. Hi there, is there a link available to coin dealers and or websites one can communicate with? Thanks.